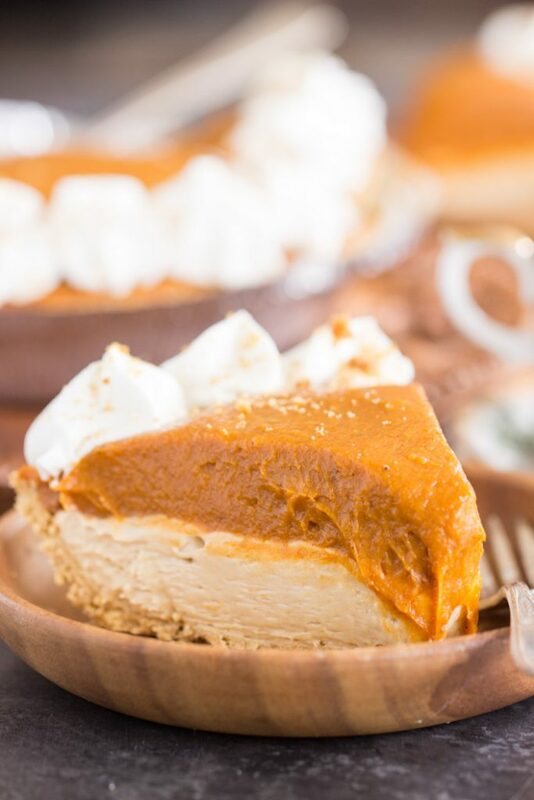 This quick and simple No Bake Double Layer Biscoff Pumpkin Cheesecake comes together in 10 minutes, and with just a handful of ingredients. 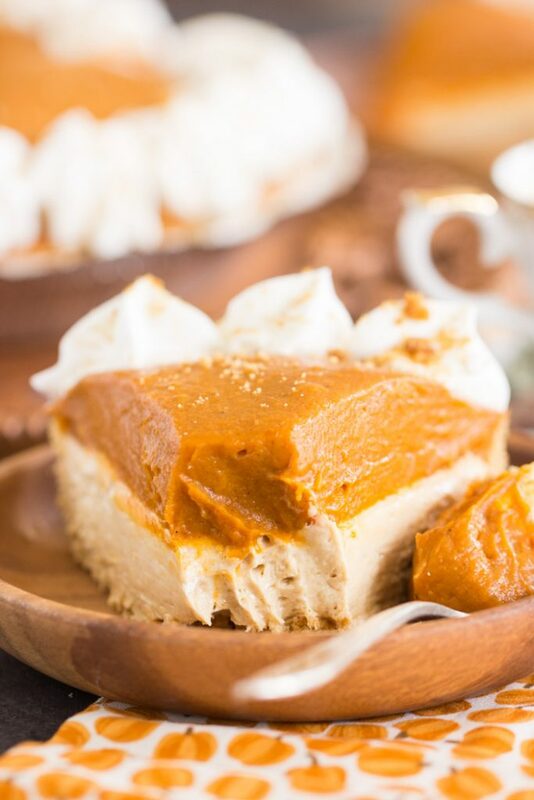 With a shortbread cookie crust, loads of pumpkin and spice, and a layer of creamy cookie butter cheesecake, this Double Layer Biscoff Pumpkin Cheesecake is a holiday must! Another day, another pumpkin cheesecake! 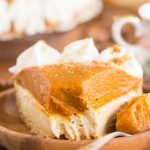 My Double Layer No-Bake Pumpkin Cheesecake is such a popular recipe, and I made two variations for you this year. I shared the first one yesterday, this Double Layer Nutella Pumpkin Cheesecake. As I said then, if you haven’t tried pumpkin and Nutella together yet, you haven’t lived!! 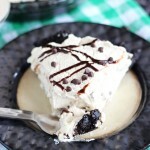 What better way to test that combo then with a 10 minute no-bake pie? What have you got to lose? 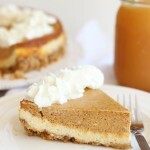 Today, I’m giving you this Double Layer Biscoff Pumpkin Cheesecake version. Like it’s counterparts, it can be prepped in 10 minutes, and only requires a handful of ingredients. You could actually make all three of these cheesecakes in no time at all. You should totally set up a pumpkin cheesecake buffet at Thanksgiving and make all three of them. I’m thinking about it. I’m really thinking about it. I mean, you could make them all in about a half hour – crazy, right? 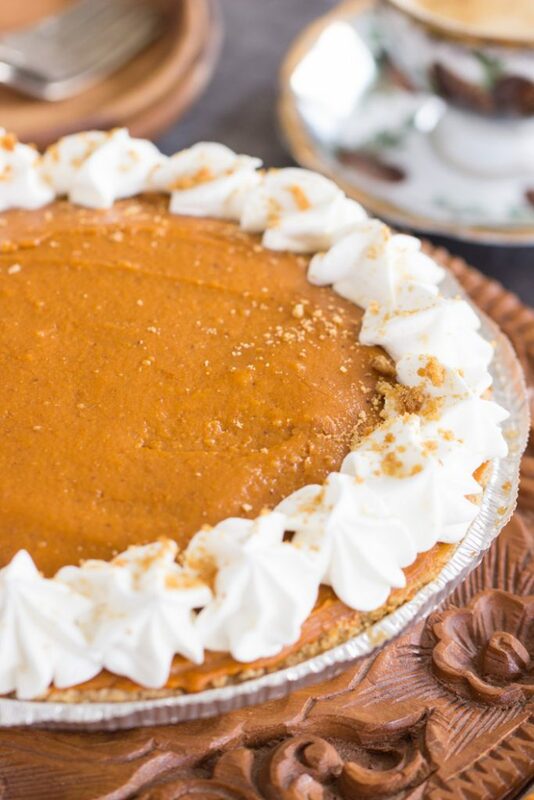 I used a store-bought shortbread crust for this pie because I was aiming to keep this Double Layer Biscoff Pumpkin Cheesecake exceptionally simple and quick – true to the original – but you could definitely make a Biscoff Crust from scratch if you want to get slightly fancier! That really only adds about 10 more minutes to prep time! 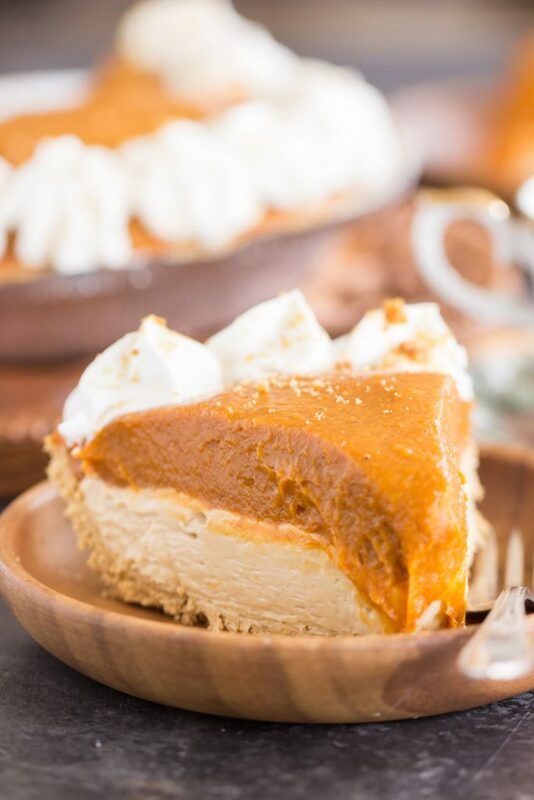 If you love pumpkin cheesecakes in general, well, I’ll spare you a run-down because you guys know I have a lot on the blog, but I have to at least mention my traditional baked Double Layer Pumpkin Cheesecake. HAPPY HALLOWEEN!!! Be ready for a few more recipes with leftover Halloween candy! 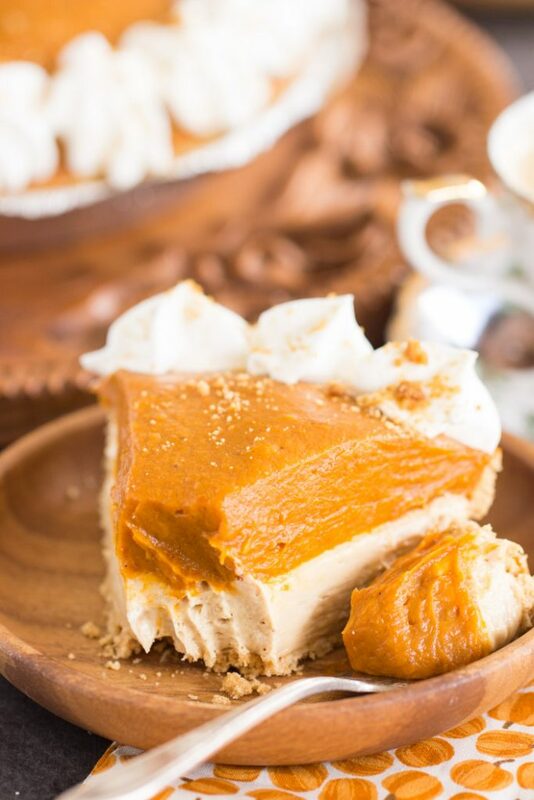 This quick and simple No Bake Double Layer Biscoff Pumpkin Cheesecake comes together in 10 minutes, and with just a handful of ingredients. 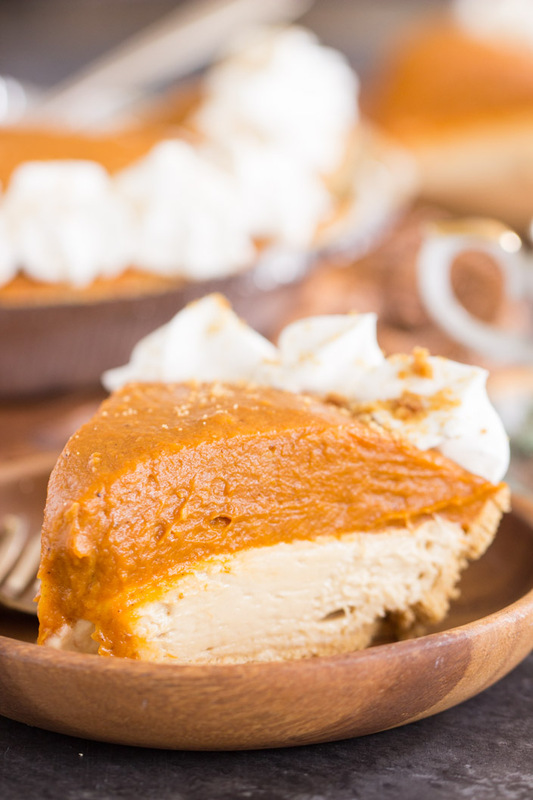 With a shortbread cookie crust, loads of pumpkin and spice, and a layer of creamy Biscoff cheesecake! Add Biscoff, mixing until combined. Spread the pumpkin mixture over the Biscoff layer. Does it get any more perfect than this? I think not. Pumpkin and biscoff are a match made in fall heaven. MUST try! I made this to try before Thanksgiving, and oh my goodness was it good! I have passed the recipe onto two friends as well. Im guessing I will be passing it onto more people once they try it on Thanksgiving. The one thing I learned was that it will make two pies if you use the regular 6oz Graham Cracker crust. Thanks for sharing!